Lawns are comprised of millions of individual plants, each craving the proper amount of water, nutrients and sunlight to thrive. The health of your lawn areas is critical to the overall appearance of your landscape and it is our mission to provide optimal care for your lawn areas. In order to achieve a healthy, lush, deep green lawn it is important to apply the correct fertilizers and weed control products at the right time of the year. Invasive weeds crowd grass and steal valuable nutrients, water and sunlight from your lawn. By providing proper care, we can make your lawn so thick that it discourages infestation of dandelions, crabgrass, and other noxious weeds. The best defense against pest problems in your lawn is to have a healthy lawn. Healthy lawns naturally defend themselves against pests. As an added level of protection, our Certified Pesticide Applicators are well equipped to manage any pest invasions that may occur. Individual site requirements and personal preferences dictate the exact products we use at each customer's location. Whether you are interested in organic treatments, lake-friendly treatments, or traditional chemical treatments, we have a solution to make sure your lawn is looking and growing its best. With Miller Landscape, your grass can be the grass on the other side of the fence that really IS greener! Crabgrass is a stubborn lawn weed. It is much more difficult to treat and kill live plants than it is to prevent them, so prevention is key. Crabgrass grows and spreads from seed. If the seeds aren't there or they don't germinate, then your lawn will be free from crabgrass. So, once you've gotten rid of the crabgrass, it becomes less of a problem to deal with. Pre-Emergent Herbicides are the best chemical control available. They work by preventing the germination of the crabgrass seeds. If you are seeding a new lawn area, wait to use any pre-emergent control as it can stop other grass seeds from germinating as well. Crabgrass gets started in the spring, about two weeks after the bright yellow forsythia blooms have faded. Soil temperatures a few inches below ground will be reaching 55-60 degrees fahrenheit and that is when the seeds will begin germination. If you time up the pre-emergent application right, your lawn will have little crabgrass to start the spring. New crabgrass will still try to take hold in bare spots along edges and in the lawn. Depending on the amount and location of the crabgrass it may make sense to treat it with a post-emergent crabgrass killer or simply pull it out. If it's late enough in the year, the crabgrass can be left and it will die over the winter. 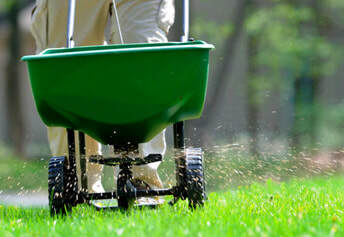 Treating with a pre-emergent the following spring will take care of the seeds and your lawn will be crabgrass free. If you are looking for chemical free options, crabgrass control is similar to weed control. A long, healthy lawn is the best defense against weeds and crabgrass. A lawn height of 3" or more is ideal. Tall, thick grass will block out the light for other seedlings. Watering cycles can help too. Adjust irrigation timing to give deep watering cycles, less frequently. Crabgrass roots shallow and seedlings will struggle if they are allowed to dry out between watering. If you are battling with crabgrass and would like us to come take care of it for you, give us a call or talk to your account manager about adding it in to your existing maintenance contract.